We’d love your help. 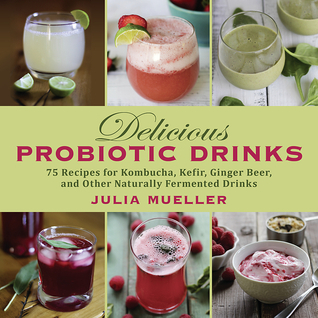 Let us know what’s wrong with this preview of Delicious Probiotic Drinks by Julia Mueller. The health benefits of probiotics are no secret—doctors from both the Western and Eastern medicine camps sing the praises of probiotics for their positive effects on digestion, metabolism, and the immune system. Enthusiasts of kombucha—a bubbly probiotic drink now sold regularly in stores from Manhattan delis to Seattle food co-ops—point to its high levels of B vitamins an The health benefits of probiotics are no secret—doctors from both the Western and Eastern medicine camps sing the praises of probiotics for their positive effects on digestion, metabolism, and the immune system. Enthusiasts of kombucha—a bubbly probiotic drink now sold regularly in stores from Manhattan delis to Seattle food co-ops—point to its high levels of B vitamins and amino acids, improving mood, energy levels, joint function, ligament health, and skin health. Now you can learn to make kombucha, as well as numerous other probiotic drinks, at home! In addition, you’ll find recipes for making yogurt, smoothies, and kefir ice cream. Fermenting drinks may seem daunting, but Julia Mueller shows how it can be fun, much more cost-effective than buying ready-made drinks from the store, and delicious! To ask other readers questions about Delicious Probiotic Drinks, please sign up. The benefits of probiotics are no secret and is something we wholeheartedly already embrace. We lacto-ferment our own veggies. And Jake has been brewing his own kombucha for a few months. We learned that if we brew kombucha with honey - instead of sugar - it's called a 'jun' and renders the drink a little bit creamy. Hmmm...I'm intrigued! With clear step-by-step directions, stunning photographs, and nearly eighty recipes this book is going to take our probiotic drink production to a whole new leve The benefits of probiotics are no secret and is something we wholeheartedly already embrace. We lacto-ferment our own veggies. And Jake has been brewing his own kombucha for a few months. With clear step-by-step directions, stunning photographs, and nearly eighty recipes this book is going to take our probiotic drink production to a whole new level. Stay tuned for our versions of beet kvass, sage lacto-fermented lemonade, sarsaparilla water kefir, and kanji. 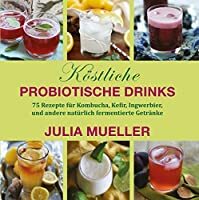 Julia Mueller nailed it with this book on probiotic drinks comprising cultured vegetable juice, rejuvelac, kombucha, Jun, lacto-fermented lemonade, ginger beer, water kefir and kefir soda, milk kefir, yogurt and smoothies. Making them at home is simplistic with vivid steps and cautionary notes. If you are not hands-on persona, the contents will equip you valuable information to make conscious choice of shopping or drink purchase. 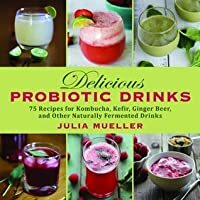 I love the easy explanations of how to make probiotic drinks in this book. The pictures are very enticing. I looked at the sample of the nook edition and it seems that it is difficult to translate cookbooks into a nook edition. I purchased the book and will start my probiotic making right away. A good variety of probiotic drink recipes in here. Ranging from simple to complex, delicious to not as delicious. My favorite thus far for making all of My fermented brews. A must have.